Italian utility company, Enel, has acquired charging point manufacturer eMotorWerks, with a view to incorporate its vehicle-to-grid technology platform as part of its global product offer. Enel already has V2G projects underway in Europe. California-based eMotorWerks supplies its own JuiceBox chargers, and operates an Internet of Things grid-balancing system called JuiceNet. This combines historic data on the driver’s charging habits with live information about loads on the grid to calculate when the supply is mostly from renewables, or to identify opportunities for energy to be sold back to the grid, avoiding demand spikes. 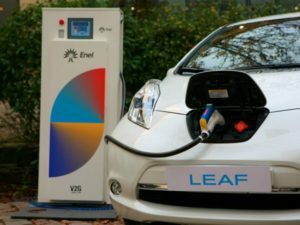 Enel, which has 25,000 smart chargers installed and vehicle-to-grid projects underway with Nissan and Mitsubishi in Europe, said it will integrate JuiceNet into its charging points in the near future, while eMotorWerks will get access to all of its new parent company’s global markets. It makes eMotorWerks a wholly-owned subsidiary of U.S. company EnerNOC, which was acquired by Enel earlier this summer for its demand response technology – this can enable businesses to power down parts of their operation, in exchange for payments, to free up grid capacity.